The Gardena 8885-U 3-Inch Cordless Lithium-Ion Grass Shears are the best cordless grass shears money can buy. You’ve been taking great care of your lawn. You’ve trimmed the grass carefully so the lawn looks beautiful. And your trusty old pair of manual grass shears are still by your side helping you with this task. But trimming the grass with manual shears can be hard work. And you’re not getting any younger. Thankfully, there’s a tool that can help make your life a little bit easier. Now you’ll be able to trim the grass in your lawn without spending a lot of effort. The tool that can help you is the cordless grass shear. So let’s take a look at the best cordless grass shears you can buy based on your requirements. What are the different types of grass shears? 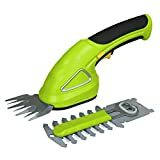 Do you need cordless grass shears? 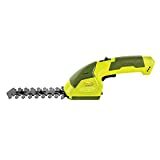 How to choose cordless grass shears? Grass shears are small, hand-held grass and shrub trimmers. They are used for precision trimming and are particularly well-suited for topiary work. Grass shears work much like a set of hair clippers, leaving a cut so smooth that you can sculpt with it. Naturally, cordless electric models are the most convenient. You can use a corded model, but you will be limited by the length of your extension cord, and you will be forced to use a thick extension cord for full power. Finally, there is the obvious risk of cutting your cord, possibly exposing yourself to a risk of electric shock. There are several different kinds of grass shears. Some are operated manually. These are just very large scissors that are used for detailed trimming. Some are designed to be operated with one hand, as opposed to the larger two-hand versions. As you might imagine, electric models are more popular because they simply require less effort. However, hand shears still have their niche uses. I use them when trimming around sensitive garden plants or trees. For instance, I have a grapevine in my yard that is still somewhat young and vulnerable. When trimming around it, I prefer to avoid electric trimming tools for fear of damaging the relatively thin and delicate vine. Depending on your situation, you may not actually need this tool. If you don’t have any places in your yard that require precise trimming, this might not be worth your money. However, if you want to do any kind of creative trimming, a tool like this is essential. Topiary gardening, in particular, is much more difficult without a good automated tool. Age may also be a factor. If you are of an advanced age, it simply isn’t realistic to continue doing a lot of gardening by hand. Also, one might argue that it’s a waste of time. An older person who wants to do a lot of gardening could certainly make good use of a set of electric grass shears. If you are not dealing with any serious constraints upon your time or health, it is possible that you don’t need them. Let’s take a look at some of the qualities that you should look at when selecting a pair of cordless grass shears. I would consider this to be the most important factor. No matter how nice your grass shears are, you want to make sure that they will continue working as long as possible. Checking the warranty information is a good way to start. A strong warranty is a good sign because it means that the company is willing to stand behind their product. A weak warranty might indicate a hit-and-run business that takes your money and sells you garbage. Naturally, you don’t want to spend a fortune on a small tool. This isn’t something that you will need to use every day, so you probably cannot afford to spend a great deal of money here. Nevertheless, you should remember that the cheapest option will often be the worst option. You are in luck because these tools are usually not that expensive. One of the main reasons to buy a set of cordless grass shears is convenience. You want something that is light and easy. A cordless model will normally give you 45 minutes to an hour of continuous run time. By choosing a model that is light and compact, you can help ensure that you get the most out of each charge. In the weight department, this tool shouldn’t give you any problems because all of them tend to be extremely light. The average weight is somewhere between two and four pounds. Battery life is very important for any cordless tool. It’s a good idea to stick with lithium-ion batteries rather than nickel-cadmium. Nickel-cadmium batteries have a problem called “memory effect” This occurs when a battery is given a partial charge. The battery will remember where the charge began and there will be a loss of voltage after the charge drops below that point. This effect does not occur with lithium-ion batteries. You should also look at the battery voltage. Batteries for electric grass shears are usually in the 3.6-volt range. However, some are as large as 7.2 volts. Bear in mind that a larger battery will add more weight, but allow for greater run time. Comfort is also an important factor. No one wants to continue using a tool that is clunky and unwieldy, or one that does not fit comfortably in the hand. You should make certain that you hold your clippers in hand and see how they feel before you buy them. For those of you that are doing detailed topiary sculpting, this will be even more important. Precise sculpting requires attention to detail, which can be difficult if you are distracted by an uncomfortable or ill-balanced tool. Your shears should also be easy to hold. A nice rubberized grip is ideal, but anything that fits securely in your hand is good enough. Most shears have two switches, but only one of them is used while operating the device. The exact location of these switches will vary, so you should make sure that they are located conveniently for you. There will normally be some variation in the length of the clipper blades. Bear in mind that bigger is not always better, since your needs may not require a long tool. Most grass shears come with two interchangeable blades. One will be about 4-5 inches long and will resemble the end of your hair clippers. The other will look more like a hedge trimmer blade and will normally be six to eight inches in length. As cordless grass shears are a bladed instrument, safety is of the utmost importance when using them. Research indicates that the most common injuries inflicted by grass shears are lacerations of the fingers. This shouldn’t really surprise anyone. The first thing to do is to make sure that the blades are lubricated and sharpened. This will help ensure that they do their job without unnecessary friction which could result in a loss of control. You should also make sure to always wear eye protection. While this machine is only designed to cut grass, there is always the chance that you could hit something else and send small pieces of debris flying into your eye. A pair of thick gloves and a long-sleeved shirt would be the most important pieces of safety equipment to wear. This brings me to another important step, which is to check the area that you are about to trim for any obvious hazards. These would include rocks, trash, broken glass, bits of metal, etc. If you are trimming a bush or tree, you should definitely watch out for wasp, bee, and hornet nests. Getting too close to one of these things with a loud electric cutting tool can have extremely unpleasant results. One of the best things about these little tools is the fact that they are so easy to operate. As stated earlier, most models are equipped with a safety switch and a power button. Normally, you will need to engage the safety before pushing the power button. Once the device is running, you can let go of the safety switch. You will need to continue holding down the power button so that the device continues running. To use the shears for edging work, simply hold them flat and work the grass between the forks where it will be cut. You want to make sure that you stay parallel to the ground for a nice, even cut. For larger jobs, most models allow you to replace the clipper head with a hedge trimmer blade using one switch or one knob. This larger blade is used mainly for shrubbery trimming. When your electric shears begin to lose power, stop and put the battery on the charger. A low-powered device is more likely to malfunction. Decorative gardening should normally be done with the smaller blade, as it allows for a greater amount of detail. It is a good general rule to move the tool in straight, long sweeps rather than picking at each spot. After all, there is no sense in wasting your time. To keep the battery in proper working order, you should make sure that it is charged up fully before being used for the first time. After this, it can be recharged from any state as long as it is a lithium battery. If you opted for another kind of battery, you need to make sure that you charge and discharge completely. You should also make sure to charge the battery completely before storing it for any significant length of time. We have already talked about sharpening, but cleaning is also very important. Like a hair trimmer clogged with hair, your shears can become clogged with grass and leaves. You should always look at your product manual to make sure that you know how to disassemble and clean the device. Always remember to remove the battery first, and never clean your device under running water. The blades should be oiled as well. A look at the internal workings of the cordless grass shears will tell you that there is more than a little friction involved here. They cut by constantly moving one piece of metal against another, so you can imagine how quickly these might degrade without lubrication. A few drops of oil before and after each use will prevent this from becoming a problem. The Gardena shears are unbelievably light, weighing only 1.21 pounds. These clippers are manufactured by Husqvarna, which is a pretty high-end company whose products normally sell for a lot more. It is decently powerful and able to cut grass and boxwood without a problem. The design is very sleek and comfortable. It fits really nicely in the hand, and the hooked lower handguard makes it very easy to hang on the wall. These grass shears are not a heavy-duty tool so don’t expect a high power output from them. These shears are made for grass and boxwood only, as is made plain in the manual. The battery may give you maximum 45 minutes of power for a full charge. The Gardena grass shears come with a 25-year warranty which is excellent if you have to deal with some problem with the tool. The Sun Joe HJ604C grass shears weigh in at 2.5 pounds. The lightweight construction makes it very good for older people. The standout feature of this model is its large 7.2-volt battery, which is about twice as large as the average battery for a tool of this kind. This battery is advertised as having a run time of 45 minutes or greater. With a 2-year warranty, you have a pretty good time to test out how this tool works for your garden. It’s a 2-in-1 model which can be used as a grass shear as well as hedge trimmer with the attachment. The blades are made from durable steel that should last you for a while. This grass shear also comes with a safety feature to prevent accidental starting. 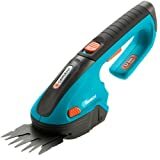 The Black and Decker grass shears are a good all-around choice that comes with two interchangeable blades. The grass clippers are four inches long while the hedge trimmer blade is six inches long. At only 1.71 pounds and about a foot and a half of length (maximum), this is a very compact device. One thing I like about this model is that the blades are very easy to change. You basically just hit one button and lift the old one out. I also like the two-year warranty and the fact that the battery indicator is right on top where it should be. One drawback is you need to hold the trigger button for the entire cutting session as there is no lock to keep it in the ON position. This grass shear is fine for small trimming work but not for thicker shrubs and branches. The Earthwise Shrub Shear is probably the smallest and lightest tool on our list. At only one pound and a little over a foot in length, it promises big performance in a small package. However, the grass blade is only three inches long, and the battery is the standard 3.6-volt variety. Nevertheless, I found this model to be sufficient in terms of power. This cordless grass shear is very inexpensive but gives some decent grass cutting power. I like the comfortable rubberized handle and I find the blades fairly easy to change. The product has only a one-year limited warranty, which is less than what some of the other cordless grass shears offer. The SereneLife model is about two pounds and a little over a foot long. It comes with the standard 3.6-volt battery which takes around four hours to charge. It features the “glide cut technology” along with an ergonomic handheld grip that makes it more comfortable while cutting grass. From the outside, this looks like a fairly durable tool. Its casing is made from thick ABS plastic and its parts are all large and beefy. I do like the fact that its trigger and safety catch are very close together. However, I find that I have to scrunch my hand up awkwardly to hit them both at once. The SereneLife cordless grass shears come with a 1-year manufacturer warranty against defects which is a bit low compared to some of the other shears we’ve seen. We think the Gardena 8885-U 3-Inch Cordless Lithium-Ion Grass Shears are the best cordless garden shears you can buy. They’ll give you a good cutting performance to keep your lawn well-trimmed. And since they have high-quality blades will last you for several seasons before you need to think of replacing them. 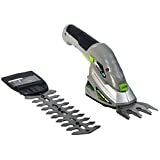 However, if you’re on a budget and just want cordless grass shears that get the job done without much fuss, consider buying the Earthwise Cordless Rechargeable 2-in-1 Shrub Shear.